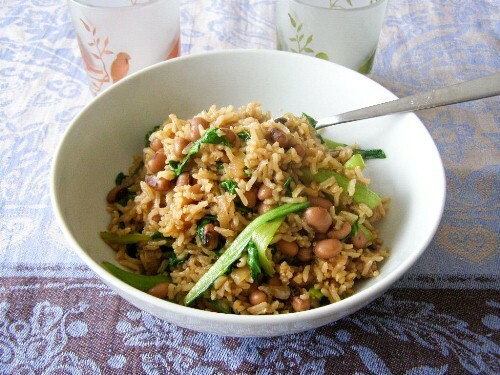 I had some pak choi and chickpeas in the fridge to use up and whipped this up - very simple but very good! You could easily swap the pak choi and chickpeas with any variety of veg and beans. See below for one variation I've made. 1/2 of a 400g can chickpeas, drained and rinsed well. Slice the pak choi by seperating the stalk from the leaf, slice both parts into strips, keeping them seperate. Start cooking rice - do not add any salt to cooking water. Heat oil in a wok and fry onion till soft. 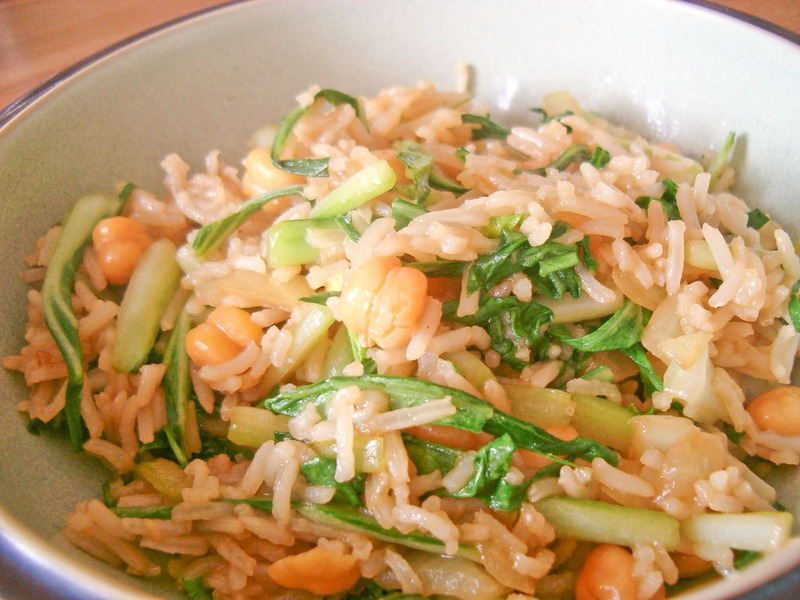 When there is 5 minutes left on the rice add the pak choi stalks; when soft - should only take a few minutes, add the garlic, chickpeas and the pak choi leaf. Stir well then add cooked drained rice and soy sauce. Stir well - serve. Get the rice cooking according to package instructions. Separate the green leaves from the pak choi stalks and slice the stalks into about 2" strips. Slice the leaves thinly and keep separate. When there is about 5 minutes left on the rice heat the peanut oil in a wok until nice and hot and add the shallots and pak choi stalks. Stir fry until the shallots start to slightly brown and the pak choi is tender. Add the garlic and beans and a few grinds of black pepper and give it a good stir - don't let it fry long here or the garlic will burn. Quickly add the drained rice, soy sauce and pak choi leaves and stir well whilst frying until the soy sauce is evenly distributed and the pak choi leaves wilt. Serve immediately.